Creativity is essential for self-satisfaction in our quilting projects (or any project) but who says this has to be a labor of love? If the project becomes too difficult, we may toss it into our "I'll deal with this later pile"! We all like to have shortcuts to make our creative spurts productive and fun! RNK Distributing offers several innovative quilting products to make constructing your embellished or traditional quilts a snap! Home Dec Fleece® has a variety of useful features but the most important is the light fusible coating which holds your top fabric in place beautifully while you stitch! The fusible coating is specialized so that no "dimples" form on the surface of the quilt once it is laundered. This also eliminates excessive pinning which makes this fleece a perfect choice for beginner quilters. Home Dec Fleece® has a generous 60" width making it a great value and perfect size for small quilts. The needle punched foundation makes it a very stable fleece/batting that is perfect for embroidered or embellished quilted items and offers enough body to create a very stable foundation for the heaviest of embroidery. When steamed or washed the fleece becomes very pliable and flexible – ideal for creating loft in quilted garments or bags - the fleece will lay and/or drape without feeling bulky or stiff, available in single sided and double sided fusible. 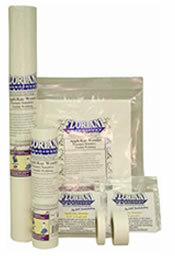 Floriani also offers a unique Tearaway for foundation / paper piecing projects. Stitch N Wash Printable Sheets® are fiber based and the perfect foundation for intricate stitching required for paper piecing. This product is a stabilizer, not paper, which creates a better stitch quality and is easier to remove from the straight stitches. This also saves your sewing needles! Leave the stabilizer in place after the piecing is done for a solid foundation for decorative quilting or embellishment stitches/ embroidery. Because the product will partially wash away, the fibers that remain behind create a nice, soft loft within the block should you choose to leave the stabilizer within the quilt. 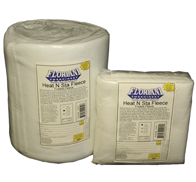 Heat N Sta Fleece® is Floriani's original fusible fleece and offers an even more dense foundation making it perfect for warmer bed quilts and heavier home dec items. This 45" width fleece offers a very soft and cozy feel within the layers of fabric. 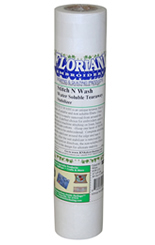 The fusible coating on both Floriani battings keeps the top layer of fabric from shifting or moving during the embellishment phase of the project. 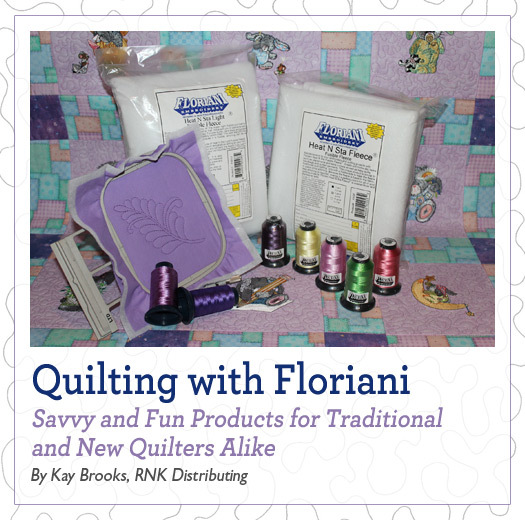 Floriani's applique products are loved by quilters world-wide! Appli-kay Wonder® is best known for its softness within the applique and this is especially important on quilts and/or a child's garment. Appli-kay Wonder® is fusible on one side and pressure sensitive on the other. 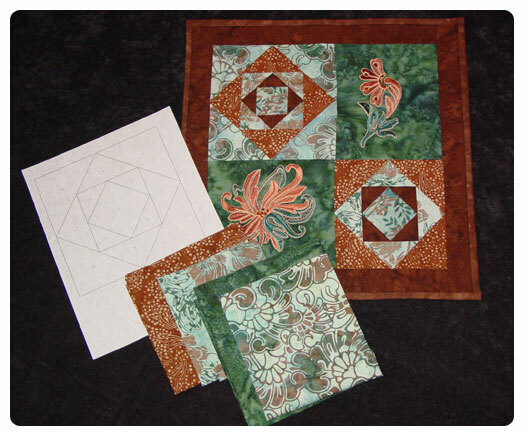 This is very handy when creating an applique motif comprised of many small pieces. 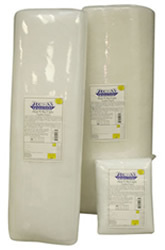 The adhesive allows you to reposition the applique pieces multiple times before bonding to the base material. Appli-kay Wonder® is also available in multiple styles/sizes. 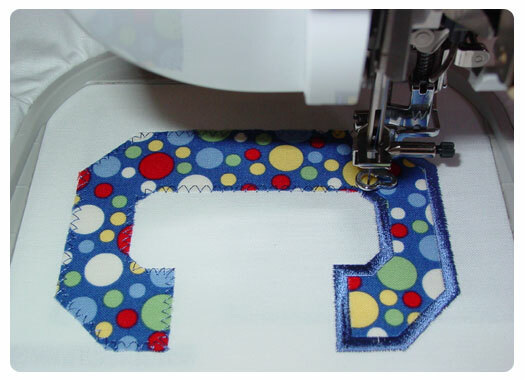 Try the printable sheets for machine embroidered applique – this eliminates the tedious step of trimming in the hoop! The new tape size rolls (2", 1.5", 1" and ½") make attaching ribbons, trims and bias tape/edging a snap! Use for scrapbooking projects also! Be sure to visit the "Applique the Floriani Way" project page for helpful tips and techniques for your next applique project. Last but certainly not least, Floriani's thread has caught the attention of quilters on all levels. Creating beautiful elongated stitches with a thread that captures the light from all angles makes your quilt exceptional! Machine stitching is emphasized when the thread makes a statement. All 360 colors of this brilliant, high-sheen thread are now available in 5000 meter cones. Long arm quilters, embroiderers and traditional quilters alike are stocking this lustrous thread for embellishment. Sew many great products to use for your next quilting or embroidery project! Remember that sewing/quilting is much more satisfying when the project has been fun and stress free. Trying new products (outside the realm of traditional) to aid in the process is worth a try!